Visiting the “City of Peace,” Assisi | Walk with us! Fr. Dominic Peluse (back left) and Fr. 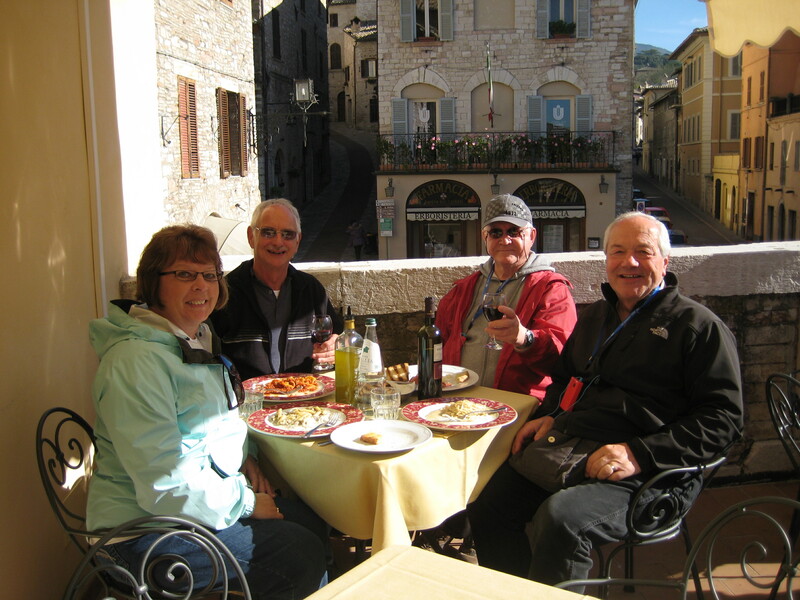 Bernie Rosinski (back right) enjoy a meal in Assisi with members of the tour group. The pilgrim group visited the city of peace, Assisi in Umbria. St. Francis would have been proud of our group. We supported all the merchant class of which his father was a member. Yes, it was a time for shopping as well as visiting sacred shrines. Our bus driver endeared himself to many members of the group by arriving at the escalator which took us to the level where the church of St. Clare was located. It saved us innumerable steps and a great deal of energy which would be needed later in the day. The church of St. Clare fronts the chapel of St. George in which the famous crucifix from which Francis heard the words: “repair my church” were heard. After some months of literal interpretation, Francis finally understood Christ to mean “the” Church, not “a” church. Clare’s tomb is contained in the crypt and other famous memorabilia are found there as well. We proceeded to the main square where the group broke up into small, manageable luncheon groups — all the better to get served quickly and thus allow time for shopping. Some of us pilgrims are learning that shopping is not just an artform but a vocation. After, the entire group followed the guide to the house where Francis was born and lived his early life. His mother was French and his father a converted Jew from Lucca. Both parents are honored with bronze statues and his early home is now a chapel. Walking down the street toward the Basilica of St. Francis was like walking the halls of history. The tour guide would point to the left and right as we proceeded and name a date, an event, an occurrence that took place anywhere from the 12th century to the 20th. Though we pilgrims were outfitted with “whispers” or wireless radio receivers, we still had to pay attention to her remarks because her English needed some polish — maybe a summer in the Sacred Heart School of Theology ESL program! She consistently would place an adjective after a noun, observing Italian grammar rather than English grammar. If one person were “poor,” then two persons were “poors.” These words are not written to mock her courageous efforts, but to indicate how hard we pilgrims had to listen. She was extremely knowledgeable. The tour guide showed us just how an illiterate people could be served by the images and frescoes in the basilica. Beginning at one end, she made her way around the entire upper church and narrated the life of St. Francis in frescoes by Giotto. It was a much appreciated tour de force. There was a brief shopping interlude in the souvenir store found just between the upper and lower parts of the basilica. Once shopping was concluded, we were shown the lower church with frescoes by Cimabue, including what is believed to be a very accurate portrait of St. Francis. This portion of our visit concluded with a trip to his tomb where the pilgrims prayed for peace and many other things. While it was a very tiring day, with all the walking and climbing, there were no complaints. Our bus driver, Nicola, got us home in plenty of time to enjoy risotto, patatine, and bistecca at the Villa Aurelia.